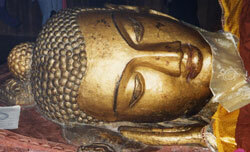 Kushinagar, where Buddha went to Mahaparinirvana. I took this photo during our visit to Kushinagar after circling this very famous reclining statue of Buddha while reciting prayers and mantras led by Khenchen Palden Sherab Rinpoche. This was an incredible place. People come from all walks of life to pay respect to The Awakened One. Shravasti, Buddha's actual home-site where he lived for 25 years during the rainy season. My beloved teacher, His Eminence, Khenchen Palden Sherab Rinpoche leads us in sacred practice: slowly walking the steps that Buddha walked himself. He had us place candles everywhere. 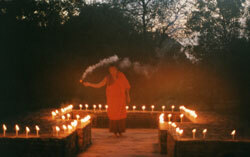 At sunset we started meditating and chanting. This is one of my favorite auspicious meditation pictures from this journey to India, illustrating an essence of deep devotion. I cropped this one...what a magical place, a sacred space. You could feel the presence of all the Buddhas of The Three Times. Rajagriha at Vulture Peak Mountain where Buddha turned the second Wheel of Dharma, and The Prajnaparamita Teachings came forth. Our Sangha enjoys the amazing view from the Vulture Peak Platform. Can you see the 'wing-like' shape of the mountain in the left of the photo? After reciting the Prajnaparamita thousands of times, it was beautiful to actually be in the sacred space where this famous teaching was created. Of course Khenchen Palden Sherab Rinpoche led us in a powerful practice… and lo and behold, as soon as we finished a giant vulture swooped low over Khenchen's head! (photo) What an auspicious sign! I'll never forget it. I barely had time to capture that moment with my camera -- it was awesome. Of course Vulture Peak isn't called a peak for nothing -- it's fairly high! The delightful young man Roma (left) was from our Padmasambhava Buddhist Center in Moscow, Russia. Miracle Mountain (though it's more like a giant hill than really a mountain), is in Shravasti where Buddha performed many miraculous activities. Debi, Janie or David must have taken this photo of me -- memory doesn't serve in this moment. 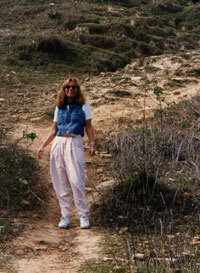 However, I do remember that on a journey to India like this you get some good exercise and lose weight! Site of Nalanda Monastery Ruins where Buddha extended his life. The land is vast and beautiful. Khenchen Palden Sherab Rinpoche gave us powerful teachings here during our visit. 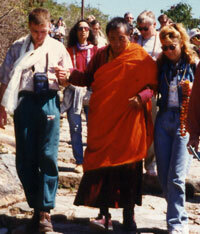 The sky was very clear that day -- what we call a Dzogchen Sky. My journey to India, this spiritual pilgrimage is coming to an end. I trust you were inspired and enjoyed viewing a few unique pictures of India, Land of The Buddha. Thanks for visiting today. May you journey around the world in Oneness to awaken and deepen Soul's experience of the wonderful trip called, life. Love with heartfelt blessings. Namasté ~ Tashi Delegs!